Waste disposal is a growing problem. The environmental system consists of a very large amount of material: about 5 x 1018 kg of air and about 1.5 x 1018m3 of water. In principle, comparatively large amounts of other materials can be dispersed in these, and consequently both the atmosphere and water bodies have long been used for disposal of wastes. This is sometimes done directly, and sometimes after partial degradation such as by incineration. In part, such disposal is based on the principle of dilution: when the waste material is sufficiently dilute, it is not noticeable and perhaps not even detectable. A variety of chemical and biological reactions may also intervene to change such input into normal environmental constituents (e.g., the chemical degradation of organic materials to CO2 and H2O). Such disposal-by-dilution methods are not necessarily harmful in principle, but several factors must be considered in practice. The first is the problem of mixing. While the eventual dilution of a given material may be acceptable, local concentrations may be quite high because mixing is far from instantaneous. As the disposal of wastes from more sources becomes necessary because of population or industrial growth in a particular area, it becomes more difficult to avoid undesirable local excess either continuously or as natural mixing conditions go through inefficient periods. A second factor of long-term importance is the rate of degradation of waste material. It is obvious that if the rate of removal of any substance from a given sector of the environment remains slower than its rate of input, then the concentration of that material will eventually build up to an undesirable level. This is the case with many modern chemical products, including some pesticides and plastics that are only very slowly broken down into normal environmental components or rendered inaccessible by being trapped in sediments. Global contamination by such materials results from the dilution and mixing processes, and concentration levels increase while input continues. The examples of DDT and PCBs, discussed in Chapter 8, are well known. Other examples, such as the occurrence of pellets of plastics in significant amounts even in the open ocean, may ultimately be of equal concern. There is also the problem of natural concentration. It is well known that some toxic materials (e.g., DDT and mercury) are concentrated in the food chain as they are absorbed from one organism to another without being excreted. Some plants can concentrate toxic materials from the soil. A third problem in disposal by dilution is the question of what concentration must be reached before harmful effects are produced. This is often difficult to answer, both because deleterious effects may be slow to develop and noticeable only statistically on large samples, and because often concentrations less than the parts-per-million range have to be considered. This is very low indeed, and often methods of detection and measurement become limiting in establishing the role of a particular substance. Finally, synergistic effects may come into play—that is, two or more substances existing at concentrations that separately are below the limits that are harmful may have highly deleterious effects when present together. Disposal by burying is a process that does not depend on dilution. In general, however, it ultimately depends either on degradation to harmless materials, or alternatively on the hope that the material stays put. Such considerations are particularly important with highly toxic or radioactive waste materials. Leaching of harmful components from such disposal sites and consequent contamination of groundwater or extraction from soils and concentration in plants are obvious concerns associated with such disposal methods. Disposal of insoluble materials in the oceans also depends upon the principle of isolation of the waste. Solid materials may be attacked by sea-water, and harmful components leached out into the water, ultimately to enter the food chain. Barrels or other containers for liquid wastes may corrode and leak. Contamination of the biological environment is a possible result. Ocean currents may play a role in distributing such wastes in unforeseen ways, as with New York City sewage sludge dumped in the Atlantic Ocean that migrated a long way from its dump site into adjacent waters. An extreme example of this occurred in 1995, when 4500 incendiary bombs washed up on Scottish beaches, injuring a child.1 These devices were believed to have come from the disturbance of an ocean dump of surplus munitions from World War II, dumped 10 km offshore in 1945, although the site had been used for munitions disposal from the 1920s up to the 1970s. Seven hundred antitank grenades and other weapons have washed up on beaches on the Isle of Man and Ireland from similar disposal sites. 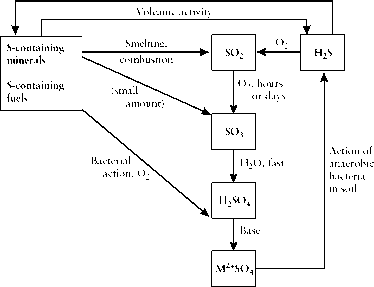 Clearly, understanding of a disposal problem involves knowledge of physical processes such as mixing, chemical processes involved in degradation reactions, chemical reactions of the waste and its products with various aspects of the environment, and biological processes, meteorological processes, geology, oceanography, and so on.